Uttarakhand School Education Board, Ramnagar, Nainital has announced the examination date of Uttarakhand Teacher Eligibility Test UTET 2015. The written exam of UTET-I & II will be held at 29 cities & 176 examination centers of Uttarakhand. The written examination of UTET-I & II will be held on 22 Jan 2017. 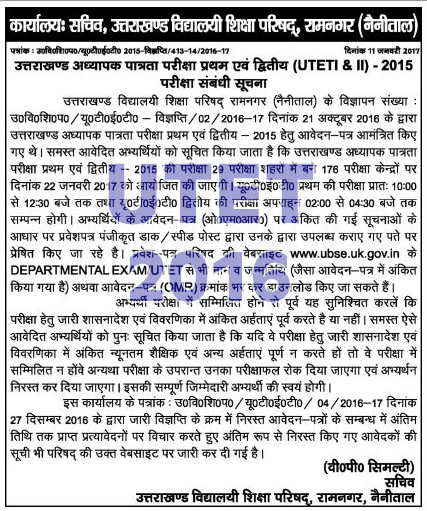 UTET 2015 exam will be held on 22 Jan 2017 as declared by Board’s Secretary D.K. Mathela. Candidates can download the examination schedule for UTET 2015 from the following link. Help us to improve this article/job posting "UTET 2015 Examination Schedule : Exam Date – 22 Jan 2017". We would be glad if you can comment below and provide your valuable suggestions and feedback. If this page have any wrong information/list or out of context content, then you can report us as well.